This entry was posted in News, Outdoors. Bookmark the permalink. I’m all for it when there’s actual negligence or blame can be clearly assigned. Maybe a better reporter would have gone and had a look at the lawsuit. This is reminiscent of the whole McDonald’s hot coffee fiasco. I concur – actual negligence is certainly worthy of litigation, but this is sadly a case of ambulance chasing. Life involves calculated risk on a daily basis. We routinely engage in one of the most hazardous activities known to humanity – driving a vehicle, which is why we have insurance premiums. While I’m saddened by the fact that the woman was injured, I don’t think the state should be at fault for what was simply an unfortunate accident. The nanny society is sadly becoming all too pervasive. Right — I won’t even speculate on what has to be proven to show negligence. When it comes to rocks breaking off a cliff who can say? I agree with the general idea that some activities are just inherently risky, but the McDonald’s woman is the wrong illustration of the frivolous lawsuit trope. She suffered 3rd degree burns on her pelvic region. 3rd degree! I once endured a 2nd degree burn in a kitchen fire, from butter literally on fire splashing on to my bare flesh. My fault entirely, but the burns were no joke. I think that the trail is fairly dangerous without the potential of rocks falling. I’ve taken my now 10 and 12 year old kids there every Summer for the past 10 years. 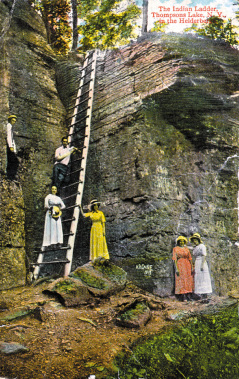 I am usually scared to death that they’ll trip along the Indian Ladder trail and wind up taking a serious tumble. This trail is not for everyone. Definitely. We watched our kids like hawks there when they were little.